The Kickstarter crowdfunding campaign for a Diamond Marimba was successful, thank you all for your generous gifts! September 3 2016. The radio show about new music HEAR AND NOW with Rob Worby broadcasts pieces of our London concert in May 2016, and an interview with Elisabeth. August 24 2016. Squeezed in between Bach and Brahms, we are delighted that our Enclosures, on Peter Adriaansz’s new CD, got 5 stars in the national daily newspaper ‘Volkskrant’! we had a great review in the concertzender blog! June 15 2016. We (finally) launched Enclosures, our favourite piece, by Peter Adriaansz, recorded in 2008. March 1 and 2 2016. Kithara I has been premièred in London by the dauntless, stout-hearted Samuel Vriezen and the good news is: it works! with many thanks to Fondation Gavigniès! 1st & 2nd March 2016. Scordatura played four concerts at the festival ‘The World according to Bob‘ in London: with works of Partch, Vivier, Mâche, Sabat, and the Vicentino project. Our project ‘Vicentino a second life‘ is part of Microfest Amsterdam in the Muziekgebouw aan’t IJ. In LIJNENSPEL (which means something like ‘a play of lines’) long sounds in a variety of shapes, waves and forms pass by like clouds at the horizon. Together they create a landscape of pure harmonies. A unique listening experience! Tenney, Sabat and Vriezen’s compositions use each in their own way ‘pure tuning’ as their tonal system. In contrast, Henneman’s solo viola piece moves from a wild and crazy rhythmic outburst of dissonants into a song of ten poetry lines, arriving to rest in a slow melody of flageolets. June 6 2015. Splendor Amsterdam opens their house for an evening in memory of Bob: a mega program full of tributes, newly written compositions for Bob, arrangements by Bob, films with Bob, we perform Anne La Berge’s composition Lumps that was written for Scordatura in 2011.
februari 21 2015.We just performed our first concert as a duo in Cork University. Including a moving performance of Alvin Lucier’s ‘I Remember’ together with our Irish friends, in memory of Bob. Making music is the best we can do right now. January 2015. Our keyboard player and artistic leader Bob Gilmore has passed away on January 2nd at the age of 53. Since we started Trio Scordatura in 2006 Bob has given us an overdose of inspiration and we will use this to continue exploring the fascinating world of tuning. Trio Scordatura will go further under the name Scordatura Ensemble, it’s a name change that Bob wanted to realise, because we enjoyed playing projects with guest players. We will continue exploring new music with an emphasis on tuning, with Bob for ever in our hearts and souls. Read here a tribute for Bob written by his friend, the composer Donnacha Dennehy. So last week Trio Scordatura successfully launched our new project Nicola Vicentino: a second life at the Orpheus Institute in Ghent, as part of their Research Festival 2014. Two of the four new pieces are now online: Christopher Fox’s new piece on our SoundCloud page here; and Lucia D’Errico’s piece here. On Friday October 31 (Hallowe’en), Trio Scordatura made its debut in Amsterdam’s cool new concert venue Splendor, at the invitation of Michiel Weidner. Four new works specially written for us by Amsterdam-based composers, together with an arrangement of one older piece written for our host Michiel Weidner. Samuel Vriezen’s setting of Peter Gizzi’s poem about Vincent van Gogh paired with the world premiere of a multimedia work combining sound, colour and word by Aliona Yurtsevich. The programme opened with two responses – by Anne La Berge and Yannis Kyriakides – to the sixteenth century microtonal madrigals of Nicola Vicentino, and closed with Guy De Bièvre’s deconstruction of old pop songs in The Many Gypsies in Me, in which Trio Scordatura was joined by Michiel on cymbalom. Brazil 84 DVD is out! September 17 2014. The new Phill Niblock DVD, Brazil 84, is finally out on Mode Records! It has our studio recordings of two of his notated ensemble works, Tow by Tom (for two “orchestras”, with our friends Nelly Boyd from Hamburg) and Three Orchids (with our friend Guy de Bièvre on dobro). A beautiful film in stunning colours, and superb sound mix by Johan Vandermaelen. Will soon be available to purchase, for that perfect Christmas present! September 12 2014. Our performance of Samuel Vriezen’s Vincent, Homesick for the Land of Pictures back in June has now been put online by Poetry International Rotterdam, where we premiered it. Check it out – http://www.poetryinternationalweb.net/pi/site/poem/item/24668/poem_eng_audio. It begins with a few seconds of tuning, by the way – the piece begins when the voice enters! We’ll play it again (Sam) on October 31 in Splendor, Amsterdam – come and hear it! August 24 2014. Our recordings of Phill Niblock’s Three Orchids and (with our Hamburg friends Nelly Boyd) Tow by Tom are finally coming out on a DVD from Mode Records, featuring Niblock’s film Brazil ’84. HOORAY! No confirmed release date yet, but SOON, so watch this space! March 24 2014. This past week we have begun rehearsals for two major new pieces, both kindly commissioned for us by the Fonds Podiumkunsten in Holland: one by Samuel Vriezen, the other by Aliona Yurtsevich. Despite their differences, both pieces are strongly rooted in the poetry that inspired them. Samuel’s piece sets a long poem by the American poet Peter Gizzi, about Vincent van Gogh; and Aliona’s uses a sequence of twelve of her own poems, each taking a different colour to symbolise a range of moods, images and emotions. 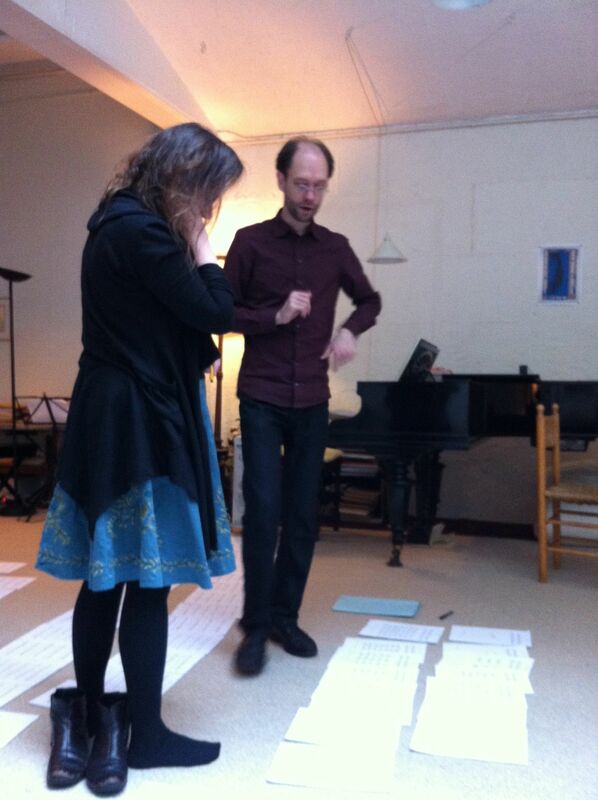 Samuel’s piece will hopefully be premiered in June, Aliona’s in early autumn; details will follow. Samuel kindly explained the form of his score (on the ground) to us. Elisabeth removed her boots as an aid to comprehension.